She Wears Red Shoes: Please Stop Telling Strangers "Happy Mother's Day"
Please Stop Telling Strangers "Happy Mother's Day"
A lot of women would love to hear three little words that would immediately make her heart skip a beat and a flush come to her cheeks. But when that handsome man smiles and says, "Happy Mother's Day," things can get a bit awkward. Years ago when I worked in a motel, I generally worked the front desk on Sundays when I would see guests off from their weekend stays. One Sunday a year was the worst day for me, perhaps for any woman without children, to work because the Southern hospitality that dictates well-wishes to strangers just becomes too much. That day is Mother's Day. Well-wishes of the sort are lovely when spoken to a family member or friend, but when spoken to a stranger, the congenial step into awkwardness, and sometimes emotional pain, is a social faux pas of preventable measure. Several reasons exist to support the reasoning of not saying these springtime holiday words to a stranger, of which the following are a few. 1. You don't know her child choices. An amazing thing has happened in the last few decades: women have realized they have choices on whether or not to have children. Rather than follow the road previous generations set out for them, modern women are deciding early on whether they have a passion to be a mother or whether motherhood is not a personal goal. Wishing someone who does not have, nor wants to have, children a "Happy Mother's Day," can turn into a shaky back and forth of, "I don't have children," followed by "Well, when you do," and the internal dialog in her head of, "But I'm not." 2. She may be trying. Some women who are sure to be glorious mothers, for many reasons may have difficulty getting pregnant. She may have an intense desire to be a mother but is struggling with infertility, and your well-meaning expression might strike her more harshly than intended. While you have walked on with your day, she is left with a twinge of heartbreak at the reminder she is does not have the child she so dreams to have. 3. She may be grieving. No greater pain could exist than to lose a child. A woman I know is a mother to three children, all of whom were lost at separate times before the age of 21. She is indeed a mother, but not with children on this earth. How she manages to get out of bed every day and still be one of the most gracious and kind women I know, is beyond me, but she is also fragile. One who does not know her and wishes her a "Happy Mother's Day," may unknowingly open that terrible wound. 4. She may be longing. Unfortunately, having children is not a guaranty that there will be someone there to share your waning years. The older woman you see may be the age of a grandmother, but hasn't seen her children in 20 years due to some rift long before. Those three little words spoken by a stranger may remind her of what is lost. 5. You just plain don't know her. Polite words spoken to the people we pass in our daily lives is a wonderfully fine gesture of good manners, but a moment of thought before speaking those words is necessary. If you were on vacation in Europe, you wouldn't tell people "Happy Fourth of July," because as an American holiday, it does not apply to them. In that example, it would only result in possibly a confused tilt of the head. Something as personal as motherhood should be treated with more thought and not left as a lighthearted greeting to a perfect stranger. 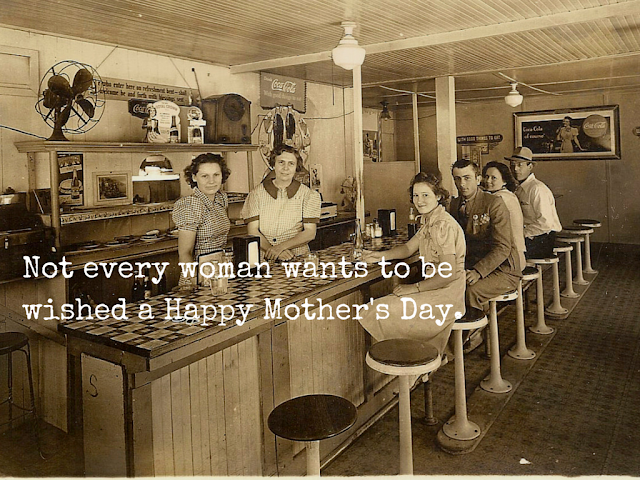 Please stop telling strangers, "Happy Mother's Day." Say it to your mother, your grandmother, favorite aunts, dear friends, but please stop dishing out these words to women you do not know. So much more lives within these beautiful creatures of womanhood that you just do not know how powerful these three little words could be when landing upon her ears. Instead, keep the greetings more generic and just say, "Have a nice day." That sentiment would apply to all women, whoever they are. Brilliantly said! I absolutely agree. I'd love to know what you think, so please leave me a comment or two. A new website is coming soon! Stay tuned for transformation of She Wears Red Shoes to www.RitaHerrmann.com. Copyright Rita Herrmann. Ethereal theme. Powered by Blogger. If you like what you find here and would like to share, please link back to this page. All content and photographs are property of Rita Herrmann and permission must be granted before using elsewhere.